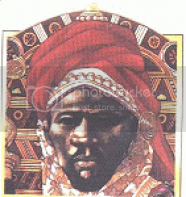 Askia the Great, also known as Muhammad Ture, was a Soninke king of the Songhai Empire in the late 15th century. Askia Muhammad strengthened his country and made it the largest country in West Africa's history. At its peak under Muhammad, the Songhai Empire encompassed the Hausa states as far as Kano (present-day Nigeria) and much of the territory that had belonged to the Mali Empire in the west. His policies resulted in a rapid expansion of trade with Europeand Asia, the creation of many schools, and he made Islam an integral part of the empire. He is reputed to be buried in the Tomb of Askia in Gao, a World Heritage site. It may be legend, but it’s commonly said that he gained the name Askia, which means “forceful one,” after Sunni Ali Ber’s daughter heard the news of Askia’s war at Anghoke where he won over the throne of Sunni Ali. To start, Askia simplified his newly-won empire and established harmony among the religious factions that were continually in conflict with one another. He orchestrated a program of expansion and consolidation that extended the empire from Taghaza in the North, to the borders of Yatenga in the South; and from Air in the Northeast to Futa Tooro in Senegambooties. Instead of organizing the empire along Islamic lines, he tempered and improved on the traditional model by instituting a system of bureaucratic government that was unparalleled in the Western Sudan region. In addition, Askia established standardized trade measures and regulations, and initiated the policing of trade routes. He also encouraged learning and literacy, ensuring that Mali's universities produced the most distinguished scholars, many of whom published significant books. To secure the legitimacy of his usurpation of the Sunni dynasty, Askia Muhammad allied himself with scholars from Timbuktu and, ushered in a golden age in the city for Muslim scholarship. He knew that a key strategy to keeping his power would be to keep the high priests of the government out of his business. He divided the empire into four parts and chose a viceroy to preside over each. Askia also made a way to have all of his family and relatives part of the government, which brought even more unity within the empire. He did this by taking the daughters of his vassal chiefs as his wives (polygamy is still practiced in some parts of Africa today), and he would marry his own daughters and nieces off to his subject chiefs, high dignitaries, governors and judges in turn. By doing this, majority of the prominent families within the empire were in some way related to him. Anyone who threatened Askia’s power was put to death without question. He also did not make it a secret that he firmly supported Islam, and he came down harshly on any non-believers who were native to Timbuktu. The eminent scholar Ahmed Baba, for example, produced books on Islamic law that are still in use today. Mahmoud Kati published Tarik al-Fattah and Abdul-Rahman as-Sadi published Tarik ul-Sudan that chronicle the history of the Sudan, (an ancient reference to Africa, not political Sudan). These are two history books that are indispensable to present-day scholars reconstructing African history in the Middle Ages. For all his efforts, Sudan experienced a cultural revival it had never witnessed before, and the whole land flourished as a center of all things valuable in learning and trade. Askia went blind in his old age, and was removed from the throne in 1528 by his son Askia Musa, when he was about 80. Interestingly, for years, the only people who knew about his blindness were his closest family members and government servants. He requested that it be kept a secret for as long as possible so his countrymen did not start to think he was sickly and weak. He chose his brother, Omar Konzagho, to act as his spokesperson so that no one directly saw Askia’s face. The residents of Timbuktu were told to Askia had an evil eye, and so they would not look directly into his eyes out of fear of a curse. But soon the truth was known, that Askia went blind, and one of his sons named, Faria Mousa, revolted against his father, forcing Askia to abdicate the throne in favor of him. According to the Tarik ul-Sudan, after around 36 years of Faria ruling, he died, and the throne was succeeded by another son of Askia’s named, Benkan. Benkan was even more evil to his father than Faria was. He exiled Askia to an island on the Niger River and took possession of the entire palace. Though, the story goes that a loyal song of Askia’s named Ismail traveled to the island to see his father. Askia felt the muscular arm of Ismail, asked him how it was possible that one so strong permitted his aged father to be "eaten by mosquitoes and leapt on by frogs." When Ismail replied that he had no money to make war, Askia directed him to a spot where he had hidden a large sum of gold. Telling him the names of those who could be counted on for support, Askia dictated a plan of battle. Ismail was victorious and Askia returned to the palace, where he died in 1538 at the age of 96. Timbuktu flourished and dominated for the next 52 years. Wealth had softened its people, however, and it wasn’t until Emperor Mansour of Morocco sent his troops across the Sahara and they attacked and plundered the city. And that is one of the many proofs of the beginnings to the slow painful downfall of Black Africa. Tragic. Those thoughts were in the back of my mind as I read the piece. Islam has ruined Africa and Africans and Africa for Africans the same way Christianity has did the same here for Native Americans and every other non-White nation they have invaded. There is no positive result of so many Africans surrendering to Islam, because not only have they surrendered their own religious/spiritual beliefs, they have surrendered damn near a 4th of the Black continent to Arabs/non-Black people that hate them, it also keeps Africans distracted from the wealth of their own birthright with wars, battles, bigotry, tribalism and a groveling loyalty to a race of non-Black people that hate them. You are soooooooo right my sista. And that's why we MUST never forget! By knowing thy enemy, you can save your future. But!